Somewhere two years ago, I wrote about a promising young band that put out a promising EP called Throw Me A Ten that became one of my favorite records of 2012. Since that time I have been waiting with baited breath for the follow up to that record. In the past few months I would occasionally run into producer Jalipaz from Audioconfusion and when I would ask him what was coming up or what he was working on, it always came to a one word response that thrilled my mind: “Diners.” Diners is, I believe, one of the best kept secrets in this town, I think this because often when I mention them, people say “Who is that?” I suppose I keep them like a secret also. 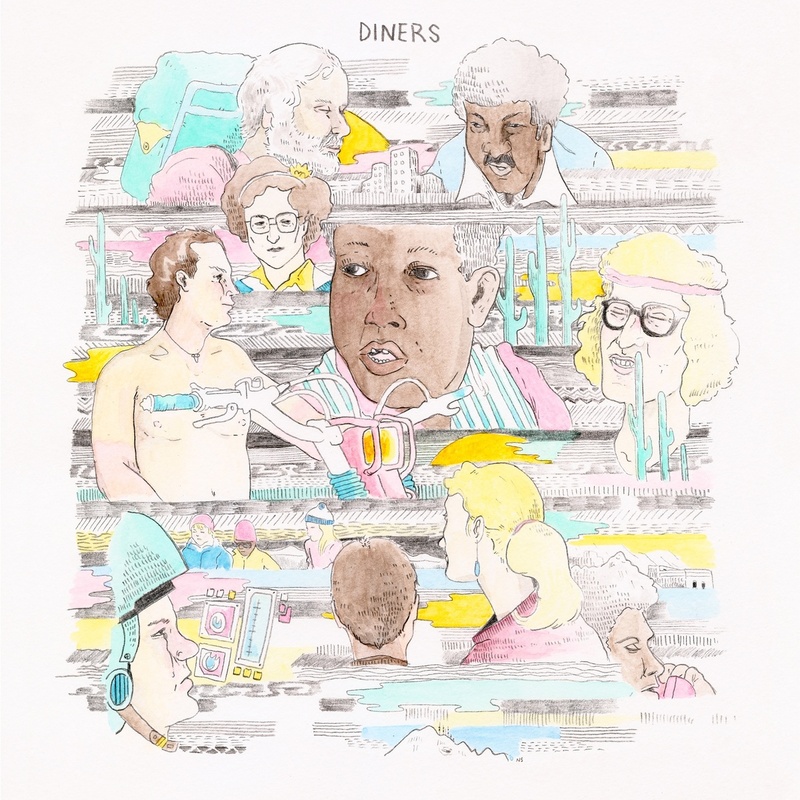 I hope 2014 is the year that by the end of it, when I mention their name, people say “Oh, I freaking love Diners!” because the wait is over and their full length album Always Room has finally arrived! Honestly, this is not your normal release, this is a thirteen song masterpiece and it’s easy for me to hear why Jalipaz was so psyched about it every time I talked him. This is perfect summery pop that like many of the other records in this issue will go into my summer playlist meant to be spent poolside in the heat and sunshine. Always Room sounds like it me well have been recorded in the mid 1960s, from the surf guitar to the female backing vocals to the tales of young love an innocence to the short songs themselves, few escape the three minute mark and only the finale crosses five minutes. Add to all of this that Tyler Broderick’s vocals are flawless in a Death Cab For Cutie sensibility, this is perfect music for the season and everyone in the band lends their absolute best to the effort here. With “Citrus”, I’m pretty sure that Ben Gibbard would be incredibly jealous upon hearing it. This is certainly single material and could easily find some airwave time, if I’m not mistaken, the refrain alone of “Don’t want to let it get away” is enough for anyone or everyone to relate to lyrically. The entire production here truly shines and the keys come to the front in an especially captivating way. “So Free” returns to a gritty surf vibe, that upon hearing it I really wanted to pair this crew up with Gospel Claws for maximum aural ecstasy. It’s another hopelessly romantic number about the simple sensual pleasures of rare moment are crystallized by the stark lyrics, ” To feel such a cool breeze, to feel the wind on your feet, to feel such a cool breeze, take it all in.” There is an amazing jazzy joy found in “Out Of The Blue” a truly laid back cocktail number involving that weird synchronicity when you think of someone for no apparent reason and the next thing you know, they’re ringing you up. “Could Be Real” very nearly defies description other than perfectly calculated and expertly crafted dream pop. Here Diners simply bring you into their dreams and you get easily lost in their imaginings. Once more the addition of female backing vocals is a genius move, lending even more to the dreamy nature of the entire song, not to mention the hypnotic guitar and swirling key. Possibly one of their finest moments. It is followed by “Gila River” an interesting link track that shows off their jazzier experiments and doesn’t even reach a minute, a fascinating transitional piece. One of the strongest on the album is “Good Zone” which is just a rollicking track and one of the few to feature a searing guitar solo, once more a paean to young love an slightly obsessive ponderences on romantic potential it is absolutely endearing, not to mention simply upbeat and blurry in the ways those thoughts about reaching toward a new love can be. Studying a dreamscape in essence, “It Was Weird” is another wistful number with effective backing vocals that complete the piece, but here the lyrics play off as pure poetry. With supositions such as “Like the dream I know you’ve had where you wake up and wander around it’s so off, but familiar you fall for it every time” you get a sense of their keen genius here. One get’s the sense by the time that “Cool Kids” rolls around that Tyler Broderick may spend a lot of time hanging on the telephone or waiting for it to ring and in the context of their style, it feels like he’s singing about a land line rotary phone fresh out of the Brady house. Here again is another sweet song about lost love and possible redemption that goes down so smooth that it never seems to cloy with oversentimentality. It’s a clever trick Diners are adept at and in a different context I might be horrified, but it totally works for them. “Daydream Receiver” (cute, wait… is that another phone reference?) is another fascinating link track that servers as the even more fascinating concept song “My House/ How Things Go” which is a pocket masterpiece loaded into two minutes, which sums up all of the worlds romantic problems in 123 seconds. One if the most brilliant moments on Always Room. The album finishes with the comparatively epic length “Overcasters” which seriously exceeds all other songs by at least two minutes. Honestly, it is in this song that I see the future of Diners because it is here that they explode in musical exploration, using all their resources to the best benefit as they find themselves in a multi-part mini symphony of their sound. Sensible enough to come full circle, when they return to the “So Free” with the swirling whirl of lyrics and harmonies of “To feel such a cool breeze to feel the wind on your feet”, it damn near makes me cry in its perfection. The album finishes with that, I was shocked, that it came back to the first lyrics I honed in on earlier in the album and it feels complete in doing so, almost creating a sense of a song cycle. I can’t imagine this album could have been produced better, I can’t imagine that the lead guitar by Andrew Kendall could have blown me away more, or Tristan Jemsek’s drumming, or Kyle Daniels and Alex Cardwell’s bass work, the saxophone of Zach Burba is astounding and the keys of Cesar Ruiz are stunning. Finally, what ties it all together is the singing which involved on this album Tyler Broderick, Kristina Moore, Talisha Royer, Jill Cook, Tristan Jemsek, Alex Cardwell, Andrew Kendall, Robert Raya, Cesar Ruiz, Erin Caldwell, Logan Greene and Mari Morton. They have achieved perfection and Always Room is, without a doubt, one of the best albums of the year. I can’t wait for the vinyl edition, that’s for certain.